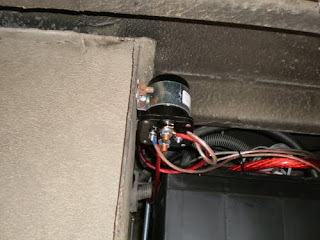 Yesterday I was able to get the battery combiner solenoid installed. I mounted it to the back of the stock battery compartment. It sits right next to the house battery bank. The first thing I did today was complete the wiring from the batteries and solenoid to the Magnum Energy Smart Battery Combiner. The battery combiner makes it possible to charge the house batteries while the bus is running without being a drain on the bus batteries. 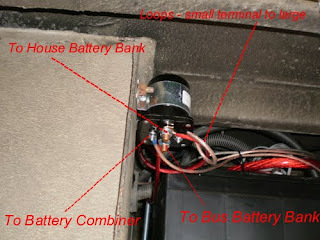 The fuse panel on the left of the battery combiner sends power to all the 12 volt fixtures in the bus. 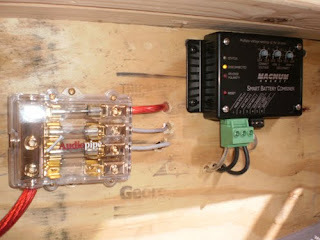 Next I built the platform for the transfer switch to go on. It sits directly over the front right wheel well. 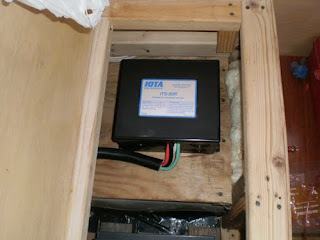 I went with the Iota 50 AMP ITS-50R Transfer Switch. 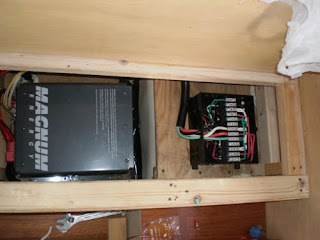 Here is the electrical panel that I have relocated directly behind the dinette seat. 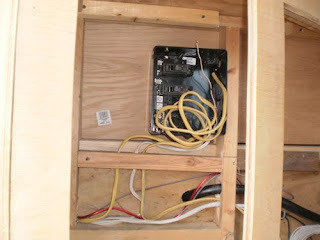 You can see the black 50 AMP cable going in the wall to the transfer switch. I will have 3 breakers. 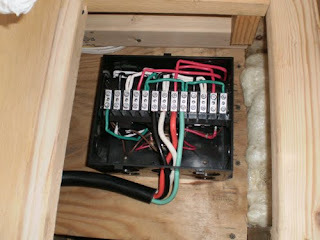 In addition to the above, the inverter has two 20 Amp amp service ports. One is wired to the Kitchen and TV the other goes to all the other remaining outlets throughout the bus.